Welcome to the Sandy Basin Chapter of the National Society of the Daughters of the American Revolution. We are located in Dickenson County, along the southwestern tip of Virginia, bordering Kentucky, in the region known as the Sandy Basin. The Sandy Basin takes its name from the fact that it is a vast plateau completely walled in by high mountains, forming a natural bowl or "basin." The Sandy Basin consists of about six hundred square miles, lying on the headwaters of the Russell Fork of the Big Sandy River. It is on the Virginia side of Pine (Cumberland) Mountain, and covers portions of Dickenson, Buchanan and Wise Counties. Some 180 million years ago the Russell Fork River began ripping a deep ravine through the northeast end of Pine Mountain on what is presently the Kentucky-Virginia stateline. This remarkable wonder of nature became known far and wide as "The Breaks." The "rim" of the Sandy Basin is broken only at the Breaks, where all of its waters gather and flow out of the Basin. 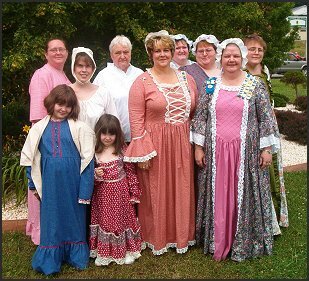 Members of the Sandy Basin Chapter, DAR, in period dress. Visit our Membership page for information on joining the Sandy Basin DAR. Scenic photographs on this page by G. Stanley.